"How then will they call on him in whom they have not believed? And how are they believe in him of whom they have never heard? And how are they to hear without someone preaching?" For five consecutive days, 1-1/2 hour each day, located in parks, and neighborhoods throughout the Northern Virginia area. Children gather to hear Bible stories, sing songs, learn Bible verses, listen to a missionary story and hear the Gospel clearly presented. It is open to all boys and girls between the ages of five and twelve. 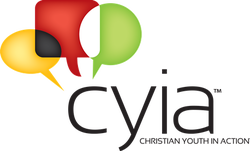 5-Day Clubs are taught by trained Christian Youth in Action teens. If you would like to host a 5-Day Club or Seasonal Party Club please email to us at wrcefnova@gmail.com. Are YOU interested in hosting a 5-Day Club in July? What is a Fair ministry? 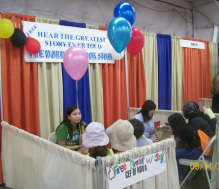 Children, teens, adults, and whole families are invited into the booth inside the commercial building to hear the Gospel, using the Wordless Book story. After they heard the story, we give out the gospel bracelet with its tract. If you want to join this wonderful opportunity, you are required to fill out the Child Protection Policy before working with children. If you have never filled out the form before, please visit the County Fair page.